A US rabbi has said Mel Gibson's controversial film about the death of Christ is already fuelling anti-Semitism, months before it is released. Rabbi Marvin Hier, founder of the Los Angeles-based Simon Wiesenthal Center, said the center had already received dozens of hate letters and calls he said were prompted by advance screening of the Gibson-directed film The Passion. Rabbi Hier's comments follow Tuesday's comments by Jewish group the Anti-Defamation League that Gibson's film was "dangerous" for portraying Jewish authorities and mobs as being behind the decision to crucify Jesus. "Are there any manifestations of hate so far? The answer is an unequivocal yes," Rabbi Hier said. "We have had hate mail in the past ... but never in spurts like this." Hier cited one writer who praised Hitler as "much kinder to the Jews than I would have been". Gibson, a committed Christian, shot the film in Italy. It stars The Thin Red Line's Jim Caviezel and Monica Bellucci, and features Latin and Aramaic dialogue, with no English subtitles. Gibson's spokesman Alan Nierob said there was no suggestion of the film being anti-Semitic. "No one associated with this film has any interest in fuelling hatred, bigotry and anti-Semitism. In fact, Mel's interest is just the opposite as he has stated previously that this film is about love, hope, faith and forgiveness." The film has also been criticised by a group of Catholic scholars, who saw an early version of the script and complained it was anti-Catholic as well as anti-Semitic. The anti-Defamation League said on Monday the film contained "dangerous teachings" Jews and Christians had tried to work against in the past. 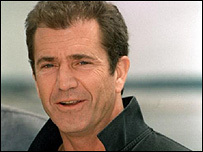 He hoped that Gibson and his film production company would "consider modifying" the movie.